NEW ORLEANS – There were an incredible amount of action across the nation in the collegiate track & field world this past weekend. 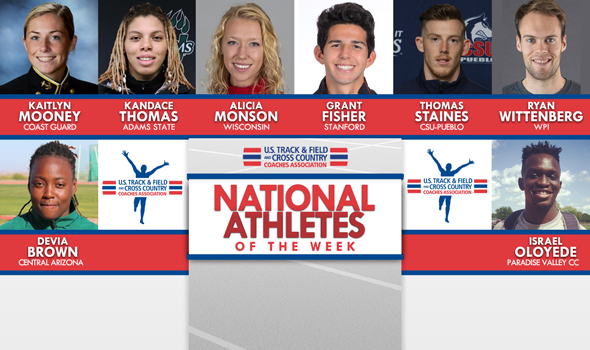 Here are eight of those athletes who stood out the most from their peers and were named National Athletes of the Week by the U.S. Track & Field and Cross Country Coaches Association (USTFCCCA) on Tuesday. Grant Fisher isn’t afraid to mix it up with the best. This past weekend at the NYRR Millrose Games, Fisher competed in the Dr. Sander Men’s 3000 against an incredibly talented field. Not only did we walk away with the win, but a truly all-time mark in the collegiate indoor record book. Fisher held off a late charge from Wisconsin’s Morgan McDonald to win with a time of 7:42.62 (McDonald finished in 7:42.76). That left Fisher as the fourth fastest performer in collegiate indoor history with the fourth fastest performance. Only recorder holder Alistair Cragg (7:38.59), Edward Cheserek (7:40.51) and Henry Rono (7:41.40) have run faster. McDonald now slots in at fifth, so it was quite the race. This is the first time that a Stanford athlete has been named National Athlete of the Week during the indoor season. It is also the first time that the Pac-12 Conference has had a National Athlete of the Week since 2017. Don’t forget about Alicia Monson. The Wisconsin junior opened a lot of eyes during the cross country season and did it once again this past weekend at the NYRR Millrose Games. Monson, running in the Fred Lebow Women’s 3000 against several top professionals, won the race in a time of 8:45.97. That made Monson the third fastest performer with the third fastest performance in collegiate indoor history. Only Karissa Schweizer (8:41.60) and Jenny Barringer (8:42.03) have run faster. This marks the first time that a female athlete from Wisconsin has been named National Athlete of the Week during the indoor season. Monson is the second Badger to earn the honor during the indoor season overall (Michael Lihrman took home three nods in 2015). Thomas Staines picked up a National Athlete of the Week honor after etching his name in the record books over the weekend. The junior posted the best all-conditions mark in NCAA Division II history with a 1:46.27 in the 800 to win the event at the GVSU Big Meet on Friday. The mark is third among college divisions this year and ranks seventh overall in the world. He also helped the program’s 4×400 team to a first-place finish the following day in running the anchor leg for the group. The time currently sits 14th overall in the country. Staines is the only athlete to ever win the National Athlete of the Week in program history during indoors. He also accomplished the feat once during the 2018 indoor season. Kandace Thomas is the National Athlete of the Week selection after posting one of the top times of all-time in the 60 over the weekend. Thomas posted a mark of 7.29 to win the event at the Adams State University NCAA Qualifier. The mark made her the fourth best performer of all-time in the 60 in NCAA Division II history. It currently leads NCAA DII. The senior is just the third athlete in program history and first female to earn the national recognition during the indoor season, joining Oliver Aitchison (2016) and Sydney Gidabuday (once each in 2017 and 2019). Ryan Wittenberg continued his stellar senior year this past weekend at the David Hemery Valentine Invitational hosted by Boston University. Wittenberg became the fifth fastest performer with the seventh fastest performance in NCAA DIII history in the 800 when he crossed the finish line in 1:49.89. It was quite the run for Wittenberg, who hadn’t clocked a sub-1:52 in the 800 in his career. This marks the first time in program history that WPI has had a National Athlete of the Week during the indoor season. Kaitlyn Mooney was back at it again. Mooney returned to the track this past weekend two weeks after clocking the third fastest time in NCAA DIII history in the indoor 3000. This time, Mooney competed in the 5000 and made sure her name was higher on the record book. The sophomore from Manahawkin, New Jersey, crossed the finish line in 16:27.30, which stands as the second fastest time in NCAA DIII history behind Amy Regan’s three-year old benchmark of 16:23.40. Out of all finishers between the three heats, Mooney finished fourth overall and was the second collegian. This is the second time this season that Mooney has been named National Athlete of the Week. Israel Oloyee is a National Athlete of the Week winner after having one of the best performances in the weight throw over the weekend. The sophomore now sits as the third-best performer all-time in the event with a best heave of 19.86m (65-2) that was recorded against a stacked field of NCAA Division I athletes at the Tyson Invitational. The performance was good for sixth overall at the meet behind only NCAA DI athletes. Oloyee is the second athlete of all-time to earn the National Athlete of the Week honor, joining Beth Krasuski who took home the award during the 2015 season. Devia Brown is a National Athlete of the Week after rewriting the record books this past weekend. The sophomore won the shot put at the Mesa Indoor & Multis with a best toss of 16.94m (55-7). The performance is the best recorded in JUCO history and beat the old mark by a foot-and-a-half. Brown becomes the third athlete in program history to earn the National Athlete of the Week honor and the first to do so since 2016.